Two events coincided for me recently. I was discussing a problem where an application was tanking from time to time, and after WAY too much debugging the problem was due to thread contention. It only showed up in production. Why? production was running on a multi-way box. A few days later I heard Brian Goetz (concurrency expert) talking about the Java memory model, its flaws, and the issues that are going to come out with the new wave of multicore processors. A lot of Java code is running just fine now AS A SIDE EFFECT. We miss a bit of this, and a bit of another, but it still manages to work. However, in the world of multicore, a lot of these problems will come out of the dark and bite us. Are you ready for this? We really need tools to come in and help us out. This came up when I was with friends, and one of our phones rang. My friend answered, had a conversation which he really wanted to end (it was obvious), and then afterwards quickly put that persons phone number into his contact list. Another friend wondered why he would put his arch nemesis into his cell phone. I knew immediately. From now on, this person is going to show up on caller ID, and my friend can safely ignore it! As I have talked to more people, they often follow this rule. Some variations even include actively getting the persons number from their or via a between friend, allowing you to never even get that first call! I was on a new Web 2.0 application last nite. The Ajax was flowing nicely through this app, and it was sure pretty. But then I started to notice some weird behaviour. If I added something it showed up fine on one page, but didn’t show up on another. As I navigated around this world I kept seeing inconsistencies from area to area. I see this from time to time, and normally it smells like aggressive page caching. I have nothing against caching at the page level. It makes a LOT of sense for many things, as the closer you get to the user, the less work you are repeating. However, you always pay a price in this balanced world of performance and scalability. In this case, there is a lot more to keep in sync, and a lot of people ignore that side of the equation. This is why I really like to have a caching layer for my applications which are further towards the DB than the web page itself. This cache does the hard work of keeping all of the info that I need in sync, but when it does change, the dynamic web pages automatically get that update. 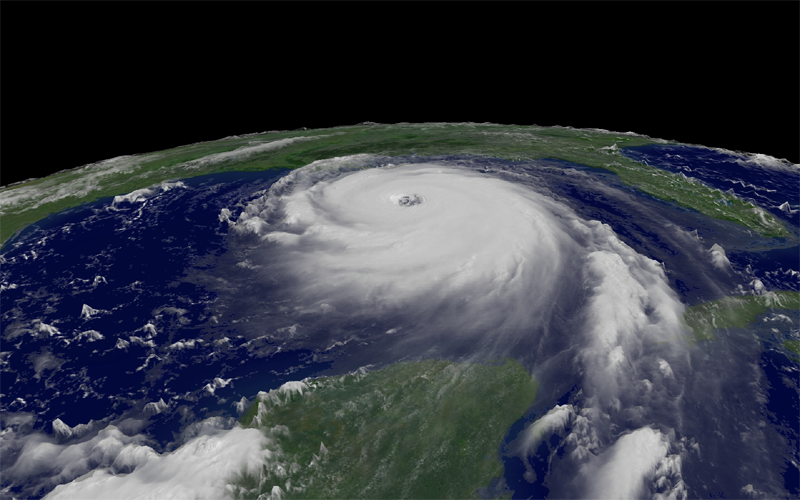 As always, this will depend on what you are doing, and it is a tricky balancing act…. but let’s try to not just turn on page caching and walk around, expecting everything to Just Work ™. He-Man: There can only be ONE master of the universe! I was chatting with my sis-in-law about a friend who wasn’t allowed to watch He-Man and the Masters of the Universe. The reason? His parents thought Prince Adam was gay? no. Duh. There’s nought as queer as folk. We decided to bite the bullet, and try a new medium. Thus started the fun and games required in getting a Podcast up and running for Ajaxian.com. We are looking for YOUR feedback and participation. Ajaxian.com is a community, and we love your ongoing input. What would you like us to cover in the podcast? Thanks for the help, give us a listen! So the feature that I am most excited about today isn’t Google Talk, or the fact that GMail is open but is is a “small” GMail addition. Now you can send email as a non-gmail address. This is the ONE feature I need in webmail. 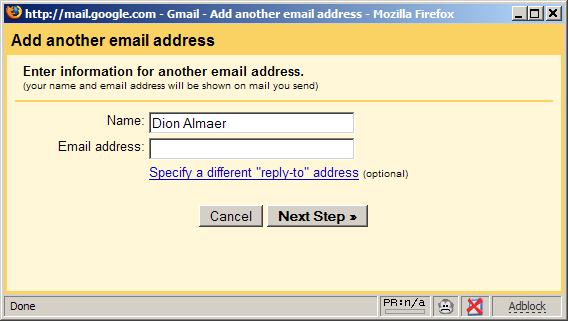 I don’t want to use [email protected], I want to use my REAL email address, but use gmail to read and store it. This is the final piece of the puzzle so I will use gmail a lot more now. Great job on that Google! Patrick Lightbody is talking about WebWork 2.2: JSR168 (Portlet) Support!. I hope that people take a fresh look at WebWork 2 and see the elegance, for those who aren’t into the component model. Google Talk: Finally here… and Windows? 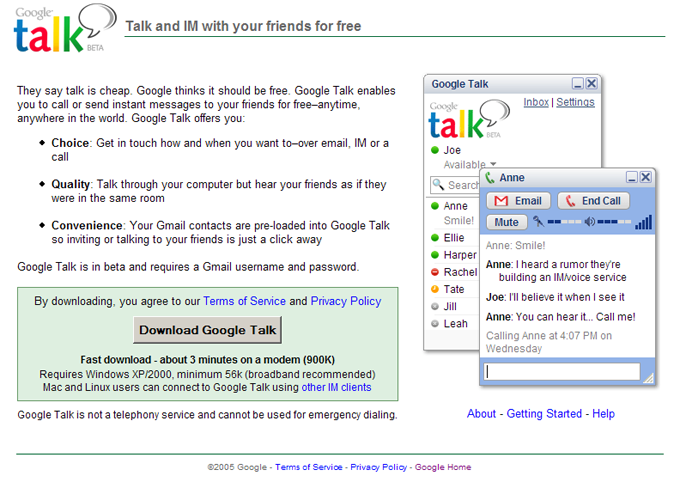 So, Google Talk is finally here. After all of the hype and the rumors. I wondered how Google would innovate in the IM arena, with the likes of Skype around. There are a few nice features such as popping up the messages, simple clean interface, and the fact that it is Jabber based. But, how come most of the developers I know at Google are Mac guys, yet the Mac is such a poor man wrt Google products. No client? I know I can use Adium/Trillian etc…. I guess I am not quite seeing the value add yet (apart from having gmail integration ;). Seems a little rushed out? Ever written a Perl application and wished that you could write some PHP in there? Ok, probably not too often…. but now you can!